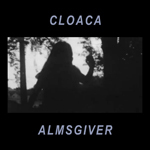 Next up in Silber’s current 5 in 5 batch, the ominously brooding approach of Cloaca with ‘almsgiver’. Perhaps best filed as doom drone, there’s certainly a degree of icy edginess attaching to these sonic signatures of portent to suggest that when they emerge into view that any vestiges of light are sucked dry into their apocalyptic shadow, sustain is the prime mover here for these hulking levianthans are cut and carved as primordial pulsars heralding an end of days disquieting chill, not I should add, for the faint of heart. Silber Records’ long-running “5 in 5” series- 5 tracks from an artist, running time only 5 minutes in total- has thrown up some interesting and innovative works that have suited the restrictive format well. Some sounds, however, simply don’t function at their best in such a constricted time, and unfortunately “Almsgiver” is an example of this. “Almsgiver” is a collection of five unique and distinctive drones, all with an acoustic origin, treated, drowned and super-manipulated by effects and ambience. It’s simple stuff, resonant, raw and powerful, with a pure tone that’s less gritty and lo-fi than the artwork might suggest. But it really needed time to breathe. When fourth track “Forsworn” segues into “Euthyphro” (the only ‘joined up’ tracks), it’s a hint towards how mesmerising these sounds would be if you could get ten minutes of each one and really start to mentally wallow in it. When “Euthyphro” then abruptly cuts at exactly 1:00, you’re left wanting more, but not necessarily in a good way. “5 in 5” has had some great moments, but this is one case where they should have foregone the novel 5-minute format in favour of a longer, more immersive release. Five tracks, one minute per track made up of noises from guitar pedals and the mixing board. My first thought prior to hearing this was “this is Soliloquy For Lilith, as covered by Napalm Death”. And that thought was correct, and its good. However, this is apparently part of a series (five in five) from the label Silber Records, and just the latest release in that series. From the opener “Edict” you are treated to a mid to high pitched drone that doesn’t out stay it’s welcome, doesn’t morph into some twenty minute prog rock noodlings, just has a deeper noise shifted across it and then stops. Track two, “Anfractuous”, is almost the last note hit before a song finishes drawn out for one minute. And then we have the high end drone of “Deciduous”. There isn’t a lot you can do in a minute, but what you are given from each track is a spartan and raw drone piece that shifts onwards before you even have chance to appreciate it. This music is quite basic, but that simplicity gives it a profoundness that makes you wish some tracks were just a little longer than they are allowed to be. This is a really interesting idea that, I think, both stretches and limits a bands creativity by giving a band a time and a track limit to work within. Given that, it can either work or fail. In this instance it’s worked, and the band have created something really quite wonderful and frustrating: you want more, but more you do not get. Here, Cloaca reiterate that less is more. Pessimists may hear this EP as half empty; optimists will hear it as half full. I would say that it’s just right, a sort of trailer for what this New Orleans project has to offer. The five cuts, each clocking in at a minute, are exactly enough to stoke appetites, from the undulating cosmic shiver of "Anfractuous" to the glacially deep rupture of "Forsworn" and the blaring "Edict," which in an alternate context might represent a traditional rock ’n’ roll soundcheck.